The uploaded document contains security features that will most likely cause eFileTexas to Fail the entire submission. We strongly advise that you edit the document to remove any security issues before proceeding with your submission. Read here for information about how to resolve this issue. FileTime is telling you that the PDF document you uploaded contains a security issue that will cause eFileTexas to Fail the entire submission. Click the Delete button in FileTime to delete that document. Then re-upload the document to FileTime. Open the offending document in the free Adobe Acrobat Reader program of something similar. 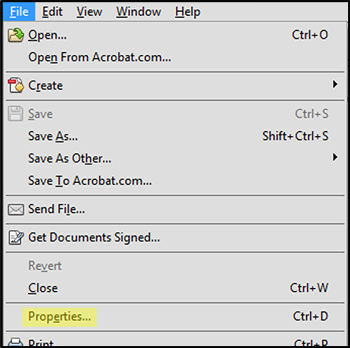 Click the File button in the extreme upper left corner and then click Properties on the drop-down menu, as shown in the screen shot below. The Document Properties window opens (screen shot below). Click the Security tab and open the Document Security page. The Security Method field should display No Security. It it displays something like Password Security, as in this example, that must be removed. 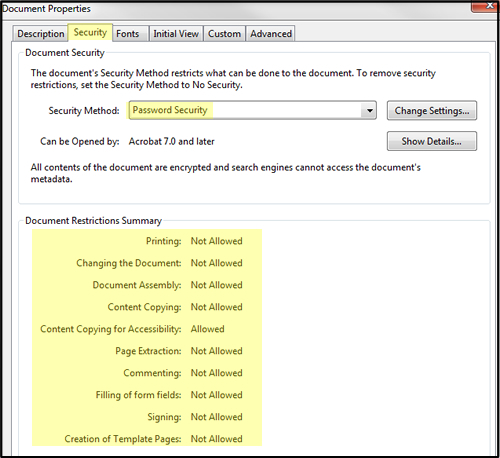 Similarly, the Document Restrictions Summary should show Allowed for all of the options. Removing the security restrictions should change any options that now read Not Allowed to Allowed.